Yannima Tommy Watson was a senior Pitjantjatjara painter who was born around 1935 at Anamarapiti, about 40kms from Irrunytju Community (Wingellina) in Western Australia. Watson was a Pitjantjatjara man, his skin group was Karimara. Tommy spent his early childhood and teenage travelling from water hole to water hole, hunting and gathering and learning from his father the practical skills on how to survive on their lands in the arid regions of the Gibson Desert. While growing up he learned to understand the significance of social organization and the spiritual and tribal law teachings of his ancestors. Watson also inherited the knowledge on how to find water and food within their region. "My grandfather's country, grandmother's country. When they were alive, they would take me around the country, when I was a kid. That's why we look after country, go out whenever we can. See if the rock holes are good"
The fate of Watson and his family and many of the other western desert nomads was sealed with the introduction of assimilation policies. This combined with the severe drought throughout the 1950's resulted in many of the Pitjantjatjara, Ngaanyatjarra and Pintupi Aborigines moving from their home lands to the administrative centres in Warburton, Ernabella and Papunya. The unfamiliar world of the Government settlements was no place for these free nomadic people who were use to a life of unlimited travel. They became disoriented, most never adjusting. Tragically, more than half of the population of these new communities died. Eventually in the late 1970's and early 1980's most returned to their traditional homelands. In 2001, Tommy became one of the first indigenous men to begin painting at the Irrunytju art centre. His work, rich in the knowledge of the topographical landforms of his country and the Tjukurrpa law that underlies it, immediiately captured attention. He painted the stories of his mother's and grandfather's country. From the start, he painted intuitively, using large vibrant colourful dots of pinks, burgundy, orange and reds to symbolically represent the dreamtime journeys of the ancient spirits and the significant episodes in the history of his tribe. By 2002, Tommy had already been honoured with his selection as a finalist at the NATSIAA in Darwin, the peak Indigenous art industry award. This was his introduction to the wider art community. A month later, one of his works was included in the Irrunytju art centre's display at the 2002 annual Desert Mob show in Alice Springs. In a matter of about 12 months, Tommy had captured the attention of the art world and his star was on the rise. Demand for his artworks amongst collectors took off and competition amongst dealers also grew. With this came controversy that was never far away during Tommy's career. Eventually Tommy entered into an exclusive representation agreement with Jon Ioannou of Agathon Gallery. This arrangement marked the start of a clear second phase of Tommy's career and saw the creation of a large body of outstanding artworks which were to further propel Tommy into the upper echelons of Australian indigenous artists. In 2005, Tommy was commissioned, along with Ningura Napurrula, Lena Nyadbi, Michael Riley, Judy Watson, John Mawurndjul, Paddy Bedford and Gulumbu Yunupingu, to produce an artwork to be permanently installed in the Musee du Quai Branly in Paris, France. If Tommy needed it, this recognition served to further cement his reputation and his standing in the indigenous art community and with collectors. Mary Knight in the book, Irruntju Arts described Tommy's style: he "uses layers of vibrant colours to symbolically represent the country of his parents and grandparents. Oranges, burgundy, reds, ivory and pinks are used to create sumptuous layers of coloured dots which ripple and surge across the canvas suggesting contours in the landscape, dry creek beds, plains of spinifex and tali (sand dunes)" (2006, p.72). 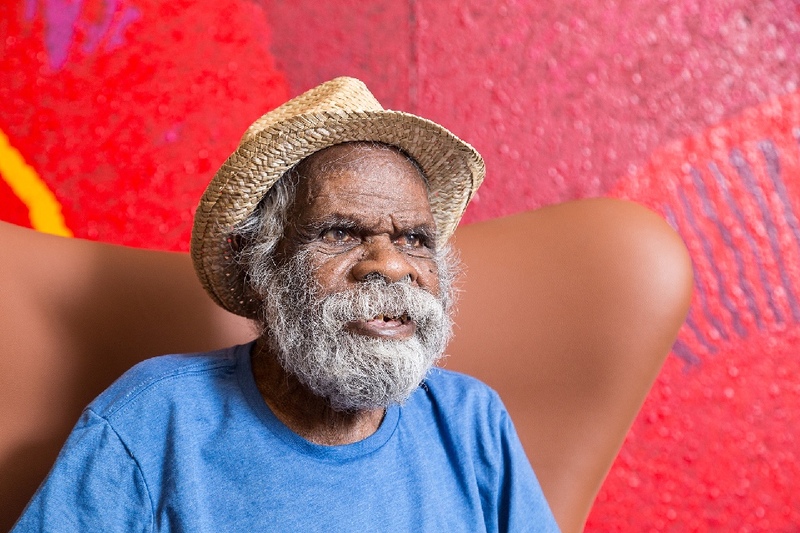 After suffering from ill health for some time, in 2013, Tommy had left Agathon Gallery and returned with his family to Alice Springs where he quickly struck up a relationship with Chris Simon of Yanda Art. This relationship heralded the start of the third and final phase of Tommy's painting career. Regaining his health and clearly revelling being back in his beloved desert environment, Tommy embarked on an amazing productive burst. This step change was announced to the world by an article that appeared in The Australian newspaper in September 2013. And what an announcement it was: this diminutive man of such tribal importance was photographed in the Todd River bed in Alice Springs next to one of the great masterpieces of Aboriginal art, a painting measuring 244cm x 488cm. Tommy Watson was most definitely back and his co-operation with Yanda Art resulted in artworks that redefined his career and drove Tommy's standing and collectability into the stratosphere. Exhibitions in Australia and internationally followed as did a second book, this one authored by Ken McGregor and Marie Geissler, about Tommy's life and his art. Tommy's art in also featured in his own art hotel in Adelaide, named The Watson. After suffering from gradually declining health, Tommy passed away in late 2017. Thanks to Ken McGregor for his contribution.